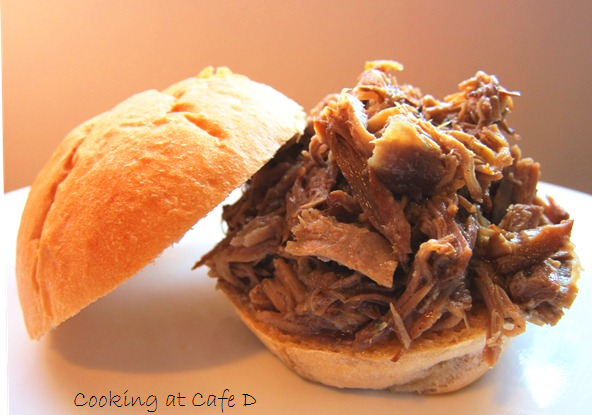 Braised Pulled Pork - So Simple. Nothing makes our home smell like love...than a pot of pork. Well, perhaps bacon on a Sunday morning...wins out. But, pulled pork comes a closed second. This is #4 in our "Low, Slow...and So Worth It" series. I made the pork above...in a rush. I completely skipped the whole searing part. I picked up the pork from the butcher. Then I dropped it fat side up in the Dutch oven. Sprinkled it with spices, tossed in some broth and a splash of vinegar. Stuck the lid on and let it go. My husband thought this might have been the best sandwich he's had. So, I think I might skip the searing next time, too! Salt and pepper the top. Add 1 t. salt to the liquid. Add thyme to top of pork. Replace lid. Braise at 350-375 for about 3.5 to 4 hours (until meat falls off bone.) I usually let the meat reach about 200 - 205 degrees. Pull meat out and cover. Separate fat. When pork is cool enough to handle, pull apart with 2 forks or fingers. Add some of the liquid back to the pork. Save remaining liquid to add later, as necessary. What is your favorite leftover pork recipe? Tell us here...or on Facebook!